Baltimore Maryland is best known for its amazing crab cakes, the Inner Harbor District, the Orioles baseball team and a great band in the jam scene known as Willies Light. The guys have been tearing it up on the east coast for several years now and are eager to take it to the next level. 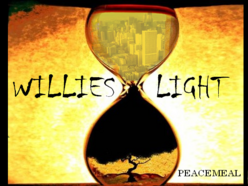 With a backbone in ‘60s & ‘70s psychedelic rock, Willies Light not only covers songs from Phish, Widespread Panic, Talking Heads and The Grateful Dead but also writes soulful originals as well. Songs are written with professionalism and each have a uniqueness all their own; ones that you could listen to over and over again without getting stale. I hear many influences in their sound but, Willies Light reminds me of Strangefolk from the early ‘90s, The Zen Trixters and even some live material from Loggins & Messina. On drums and the driving force behind the band is Matthew Pugh whose playing is spot on and just the right touch for this band. He is humble, passionate and his vision can be clearly felt when talking about music. On percussion and filling in the gaps is Barry Cooper who also lends a dynamic approach to the rhythm section. On bass is Nick Verdis who is a master with his instrument and from what I hear, the 'secret weapon' in the band. Nick is one of those players who I would love to see perform live to capture the essence of his technique. On guitar and vocals is Hall Williams who deserves to be nationally known for his voice and playing abilities. Hall’s singing is addictive, inspirational and produces lines that will stick in your mind long after the song is done. On some occasions, the band has the fortune of having Jason Crosby sit in on keys who adds a whole new dimension when playing with the guys. Crosby’s piano licks are eloquent, graceful and have a big sound just like Rob Barraco. I am eager to see this band explode on the scene, playing at major festivals and touring the states in the coming years. Recently, the guys put out an album called Peacemeal but songs are littered all over the internet on various websites for fans to download and listen. I urge everyone to click every track out there, you won’t be disappointed if you are looking for soulful, funky, passionate and professional songs. Some of my favorites are Blue Bird, One to One and I Don’t Want to Say Goodbye. Baltimore is a good spot for this band being so centralized on the east coast, close to New York and lying just north of the Carolina's. The area means a lot to me, having gone to school in College Park. Matt and I spoke over the phone about his band, the jam scene on the east coast and what’s in store for Willies Light in the coming year. This band has what it takes in terms of songs and the live performance. I just hope that fate and recognition come knocking at their door quickly. These guys deserve more attention for their hard work and stellar performances. It has been a pleasure getting to know Willies Light. The band is based out of Baltimore. What’s the scene around Maryland and how far do you have to drive locally to play shows. The scene in Baltimore is really cool with a great musical history that goes back pretty far. In the jazz era here, there was a really a hot nightlife. For years, Baltimore Arena was the only one in the area that had big name acts like The Stones and Led Zeppelin. 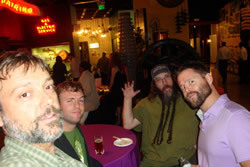 The jamband scene is alright, we had The Bridge come out of this area and some other groups that play once in a while. We also get some of the touring groups that play the local clubs. Around here is Baltimore, DC and New York is not far. Take us back for the jambandfriendly audience who doesn’t know the history of the band. How did it form and what was going on in the beginning? I met Hall Williams our guitarist back in December of 2005 through a website called Baltimorebands.com. I was playing with him and some other guys in a band called Yellow Number 5 for two years and then Hall and I stuck together with musicians coming and going. The current lineup has been together for two years and also met the bass player online. We had some humble beginnings taking every gig we could get while continually playing. Hall used to play for a band in the early ‘90s called Everyday People which used to tour with Aquarian Rescue Unit and other big names. Hall is from Vermont and got to see Phish perform in the early days at parties. He played with Jason Crosby who played with Robert Randolf & The Family Band and recently with God Street Wine. We now have a percussion player named Barry Cooper who goes way back with Hall and played in a band called Fat Apple. That band was involved with the jam circuit from the early ‘90s on the east coast. Nick our bass player is the youngest player in the band and our secret weapon. He is only 26 years old and into the modern, up and coming bands out there. Besides the obvious like Dylan, The Dead and the east coast jam bands, what are some of your other influences? It’s funny because we are into the main jam bands but if you look individually in the band, everyone has their own specific likes. For me, I have always been into Led Zeppelin and John Bonham was my favorite drummer growing up. My tastes tend to be a little bit edgier and leaning more towards a rock sound but also love Bob Marley and Phish. Nick our bass player is into funk and our percussion player is into Zappa. Hall is into the Dead so we have a lot of strong influences that make up who we are. Nick is more influenced by the contemporary bands like Tea Leaf Green and Lotus. What about the musical Growth in the band over the last two years? Do you see yourself hitting some plateaus and then climbing to new levels? Talk about that aspect in the band since the bass player joined. We have definitely grown over the last two years but recently have seen a little buzz happening around the band. We see some repeat faces at the shows, not just our friends but people who are showing up and checking us out. This has been a motivator to want to improve as a band and always get better. Some of the things we try to focus on is really listening better and adopting a less is more approach giving everyone breathing room. We have all been challenged to listen and do a lot of round robin exercises. We have even incorporated the “hey” exercise that Phish is known for. Everyone plays a pattern within a jam and once they are comfortable with it, they yell "hey" and move onto the next person until everyone is locked in. We also try to work on transitions better, in and out of songs and making a conscience effort in practice to find unique bridges into other songs within our repertoire . We want to have a better show overall and not talk between songs. Ultimately we want the flow of the performance to be smooth and professional. Your most recent album, Peacemeal, where was that recorded and how was the process? We did it at Lion Fox Studio in College Park Maryland and everything went very smoothly. One of the engineers who worked on the project I actually went to high school with and he does the sound for the baseball team The Nationals out of DC. He’s also done sound for major festivals and hot reggae bands. We reached out to him and told him we wanted to do an album, but separate it up into two different EP’s. We wanted to do it in clusters with the first one being Peacemeal. We had been playing the songs for a couple years and were really comfortable. Over the course of a couple weeks, everyone contributed with their parts and managed to get it done. Jason Crosby came down from New York to record with us on keys and then ended up playing an acoustic gig that evening. We didn’t want to create a perfect studio album. We wanted to capture what we do live and give people a general feel for the sound that they would hear live. When we have a keyboard player with us, we are at our best in the live setting. We want to give this album away and share the music with everyone. What kind of band do you guys want to be? Would you say the band is ready for a hundred shows a year, national tours with a big devotion or are you all just concentrating on the immediate area? How are you setting your sights? I think we are ready for touring. We are open to the possibility and the ultimate goal for us is to be a band that plays all original music. We've been concentrating on our shows and song presentation and making sure the people who come to see us are enjoying what they are hearing. We would all want to be doing this full time, but right now it is a one step at a time process starting with the most important thing first, tightening our music. If we go national then great. It would be amazing to do a couple of opening slots in the region for named bands like Tea Leaf Green. Everyone is getting the itch to do more and get out there. What’s planned for 2011 and this Spring? We have shows locally over the next couple of months and have tentative plans to go back into the studio at Lion Fox Studios probably late March or April. This will be the second half of Peacemeal and we’ll release that cluster. By the beginning of summer, both albums will be out and we’ll just go in and capture the live sound in the process. Jason will come down again and we’ll just have to see how it goes. We definitely want to play the festivals on the east coast, some of which we have done already. We are hoping to get selected to play Art Scape in Baltimore which will be great to share the stage with big names like Karl Densen, Gov’t Mule with some others. You guys will have no problem keeping up with those other names. It seems like you have a really good thing going. Good luck with the second album and all the shows around Maryland. Jambandfriendly.com wishes you a lot of luck and supports you in the coming year.